Many discussions of standards in a Lean context do not address purpose. In Manufacturing, product quality cannot be guaranteed unless the same operations are done the same way on every unit, regardless of time, shift, day, or even plant. This is why you need Work Standards and Job Breakdown Sheets. To achieve high productivity, you then need to design operator jobs to fill up the takt time with useful work, consistently throughout their shift, and without overburdening them. 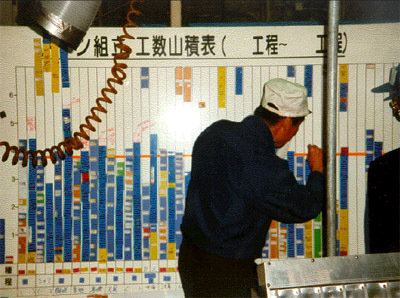 This is the purpose of Standardized Work, which is visible in manual assembly in the form of Yamazumi charts and, where human-machine interactions are involved, Work-Combination charts. What is remarkable in Lean plants is that management pays attention to standards and that operators actually follow them. Elsewhere, the standards are in 3-ring binders sitting unread on shelves and containing obsolete information, with the knowledge of how the work is actually done residing only in the heads of the people who do it (See Figure 1). 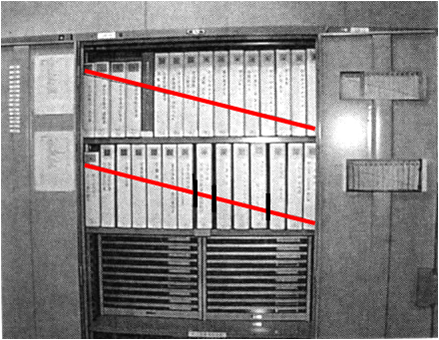 To make sure the binders are actually on the shelf and in the proper order, it is becoming common as part of 5S to run tape across the back as shown here. The primary purpose of such binders is to show their own existence to auditors. There usually is no space or music stand provided near operator work stations to hold then open. The content is usually based on verbose boiler plates and generated by writers who do not leave the offices. Clearly, this is not an effective method to direct how work is actually done. The Lean approach is to provide instructions in A3 sheets posted above each station. For examples, see Figures 2 and 3; for details, Lean Assembly, pp. 157-163 and Working with Machines, pp. 133-153. The relationship between standards and Kaizen is complex. The existence of effective standards is not a precondition for improving operations, or else too many operations would be impossible to improve. Once standards are in place, however, they provide a baseline for future improvements. Have the standards include a transparent and simple process for improving them. Employee email addresses are an area where standardization is directly detrimental to the objectives pursued by the company. Except for those involved with sales or public relations, most companies do not publish their employees’ professional email addresses, so as to protect them from spammers and recruiters. Yet they generate these addresses in standard formats, the most common being first-name.last-name@domain-name.com. This standard is easily inferred from the business card of a single employee, and enables any outsider to build an email list by retrieving names from a social network and formatting them to the standard. System of units. In US plants of foreign companies, it is not uncommon to encounter both metric and US units. Companies should standardize on one system of units and use it exclusively. Technical parameters of the process, such as the torque applied to a bolt, or die characteristics in injection molding, diecasting, or stamping. Instruction sheet formats. Supervisors who monitor the work with the help of instruction sheets posted above each station need to find the same data is the same location on the A3 sheet everywhere. Operator interfaces to machine controls. Start, and emergency stop buttons should look alike and be in consistent locations on all machines. So should lights, sounds, and messages used for alarms and alerts. Andon lights color code. Andon lights are useless unless the same, simple color code is used throughout the plant, allowing managers at a glance to see which machines are working, idle, or down. Performance boards for daily management. Having a common matrix of charts across departments is a way to ensure that important topics are not forgotten and to make reviews easier. For a first-line manager, for example, you may have columns for Safety, Quality, Productivity and Organization, and rows for News, Trends, Breakdown by category, and Projects in progress. posted on walls for visitors to see. More generally, corporate Lean groups should refrain issuing standards that mandate implementation tactics at the plant level. Tom DeMarco made a useful distinction between methods and methodologies. Methods are like tools in a box: as a professional, you pick which ones to use as needed to solve the problem at hand. A methodology, on the other hand, walks you through a sequence of 12 steps that supposedly leads to a solution regardless of what the problem is. A methodology is an excuse for not thinking; it turns people into what DeMarco calls “template zombies.” He writes about software development, but there are template zombies in Manufacturing. Question 1: How to boil water? Answer 1: Take a pot, fill it up with water, place it on the stove, turn on the burner, and wait. Question 2: How to boil water, when you already have a pot of cold water on the stove? Answer 2: Empty the pot, put it away, and you are back to Question 1. Not only do methodologies make you do unnecessary tasks, but they also restrict your achievements to what they can be effective for. In many companies that have corporate Lean programs, as a plant manager or engineer, you will get no credit for improvements by any means other than the standard methodology, and may even lose your job for failing to apply it, regardless of your results. Instead of trying to develop and enforce a standard, one-size-fits-all methodology for all of a company’s plants — whose processes may range from metal foundry to final assembly — the corporate Lean group should instead focus on providing resources to help the plant teams develop their skills and learn from each other, but that is a different discussion. When a production supervisor notices that an operator is not following the standard, it may mean that the operator needs to be coached, but it may also mean that the operator has found a better method that should be made the standard. But how do you make this kind of local initiative possible without jeopardizing the consistency of your process? The allowed scope for changes must be clear, and there must be a sign-off procedure in place to make them take effect. I remember an auto parts plant in Mexico that had dedicated lines for each customer. Some of the customers demanded to approve any change to their production lines, even if it involved only moving two machines closer, but other customers left the auto parts maker free to rearrange their lines as they saw fit as long as the did not change what the machines did to the parts. Needless to say, these customers’ lines saw more improvement activity than the others. 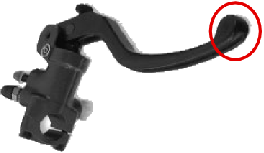 In this case, the production teams could move the torque wrench closer to its point of use but they could not replace it with an ordinary ratchet and a homemade cheater bar. The boundary between what can be changed autonomously and what cannot is less clear in other contexts. In milling a part, for example, changing the sequence of cuts to reduce the tool’s air cutting time can be viewed a not changing the process but, if we are talking about deep cuts in an aerospace forging, stresses and warpage can be affected by cut sequencing. If a production supervisor has the authority to make layout or work station design changes in his or her area of responsibility, it still must be done with the operators, and there are several support groups that must be consulted or informed. Safety has to bless it; Maintenance, to make sure that technicians still have the required access to equipment; Materials, to know where to deliver parts if that has changed. Even in the most flexible organizations, there has to be a minimum of formality in the implementation of changes. And it is more complex if the same product is made in more than one plant. In the best cases, when little or no investment is required, the changes are implemented first, by teams that include representations from all the stakeholders, and ratified later. We can move equipment on the basis of chalk marks on the floor, but, soon afterwards, the Facilities department must have up-to-date layouts. The more authority is given to the local process owners, the easier it is to implement improvements, but also the more responsibility upper managers assume for decisions they didn’t make. The appropriate level of delegation varies as Lean implementation progresses. It starts with a few, closely monitored pilot projects; as the organization matures and develops more skills, the number of improvement projects explodes, and the local managers develop the capability to conduct them autonomously. At any time, for the upper managers, it is a question of which decisions pass the “sleep-at-night” test: what changes can they empower subordinates to make on their own and still sleep at night? If there is a proven method today to document manufacturing processes in such a way that they are actually executed as specified, it is Training Within Industry (TWI). The story of TWI is beginning to be well-known. After being effective in World War II in the US, it was abandoned along with many wartime innovations in Manufacturing, but lived on at Toyota for the following 50 years before Toyota alumni like John Shook revived it in the US. It is based on World War II information technology. It is difficult to imagine, however, that if the developers of TWI were active today, they would not use current information technology. It includes nothing about revision management. There is a TWI Problem-Solving Manual (1955), and solving a problem presumably leads to improving the process and producing a new version of job breakdown, instructions, etc. This in turn implies a process for approving and deploying the new version, archiving the old one and recording the date and product serial numbers of when the new version became effective. The developers of TWI may simply have viewed revision management as a secondary, low-level clerical issue, and it may have been in their day. The pace of engineering changes and new product introduction, however, has picked up since then. 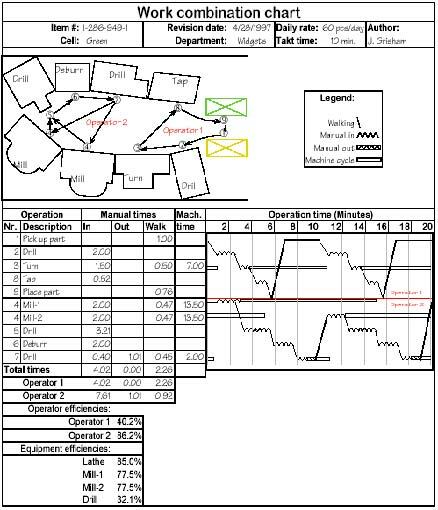 In addition, in a Lean environment, changes in takt time every few months require you to regenerate Yamazumi and Work Combination charts, while Kaizen activity, in full swing, results in improvements made to thousands of operations at least every six months for each. In many manufacturing organizations, the management of product and process documentation is slow, cumbersome, and error-prone, particularly when done manually. Today, Product Documentation Management (PDM) is a segment of the software industry addressing these issues. It is technically possible to keep all the standards, with their revision history, in a database and retrieve them as needed. The growth of PDM has not been driven by demands from the shop floor but by external mandates like the ISO-900x standards, but, whatever the reasons may be, these capabilities are today available to any manufacturing organization that chooses to use them. Using software makes the flow of change requests more visible, eliminates the handling delays and losses associated with paper documents, allows multiple reviewers to work concurrently, but it does not solve the problem of the large number of changes that need to be reviewed, decided upon, and implemented. Making each change proposal undergo the review process that it needs and no more than it needs. Filtering proposals as early as possible in the review process to minimize the number that go through the complete process to ultimately fail. Capping the number of projects in the review process at any time. Giving the review process sufficient priority and resources. In principle, revision management can be applied to any document. In practice, it helps if the documents have a common structure. If they cover the same topics, and the data about each topic is always in the same place, then each reviewer can immediately find the items of interest. This means using templates, but also walking the fine line to avoid turning into DeMarco’s template zombies. If you ask a committee of future reviewers to design an A3 form for project charters, it will be a collection of questions they would like answered. Accountants, for example, would like to quantify the financial benefits of projects before they even start, and Quality Assurance would like to know what reduction in defective rates to expect… Shop floor teams can struggle for days trying to answer questions for which they have no data yet, or that are put in a language with acronyms and abbreviations like IRR or DPMO that they don’t understand. More often than not, they end up filling out the forms with text that is unresponsive to the questions. The section of the organization that is the object of the project, and its boundaries. The motivation for the project. The current state and target state. A roster of the team, with the role of each member. A crude project plan with an estimate for completion date. A box score of performance indicators, focused on the parameters on the team performance board that are reviewed in daily meetings. The same thinking applies to work instructions. It takes a special talent to design them and fill them out so that they are concise but sufficiently detailed where it matters, and understood by the human beings whose activities they are supposed to direct. It is also possible to display all instructions on the shop floor in electronic form. The key questions are whether it actually does the job better and whether it is cheaper. In the auto parts industry, instructions are usually posted in hardcopy; in computer assembly, they are displayed on screens. One might think that the computer industry is doing it to use what it sells, but there is a more compelling reason: while the auto parts industry will make the same product for four years or more, 90% of what the computer industry assembles is for products introduced within the past 12 months. While the auto parts industry many not justify the cost of placing monitors over each assembly station, what computer assemblers cannot afford is the cost and error rate of having people constantly post new hardcopy instructions. In the auto industry, to provide quick and consistent initial training and for new product introduction in its worldwide, multilingual plants, Toyota has created a Global Production Center, which uses video and animation to teach. 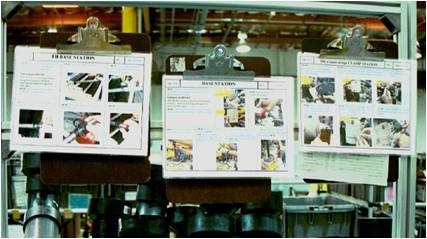 To this day, however, I do not believe that Toyota uses screens to post work instructions on the shop floor. In the assembly of downhole measurement instruments for oilfield services, Schlumberger in Rosharon, TX, is pioneering the use of iPads to display work instructions. Generally speaking, rarely have I ever seen “work instructions”, “job breakdown sheets”, or “standardized work” displayed on the floor “for the operators”. Those hardcopies or electronic versions aren’t for the operators, they are for managment to audit (so it’s very visual when work isn’t being completed to standard, or they are for trainers to refresh themselves before following JI method of instructing. If you ask an operator if they ever reference those (and point to the hardcopies) 99% of the time they’ll say no. They do the job as they were told and shown…which is why it’s important to standardize the training and the checks of that training by management. Having them there, “just in case” is fine, but the trainer / team leader should be doing periodic checks vs. the standard and if there is a discrepancy, they go back to the work standard and correct the individual before habits and muscle memory are built of a non standard method. All the defined standards except for the one related to safety should be reviewed for improvement/deletion based of any feedback regarding it, of course with proper approval and documentation. It seems to me you’re lumping standards (minimum requirements, tolerances) in with standardized work. The first is concerned with results while the second is about process. While both are important, it’s a very important distinction for this conversation. It’s very hard to maintain any improvement or perform any experiments unless the standardized work has been defined. In terms of the investment of time, I think process documentation like Google Maps–for some trips all you need to see are the major roads, while others require street by street directions with street view for most detail possible. It’s a matter of investing time in Plan rather than Do–which is not natural for most managers. It was said that no one could improve anything that you have not measured. Standards are results of measurement which at certain level and through times proven to work-well against organizational goals and objectives. It is the cursor that defines excellence from mediocrity; exemplary from ordinary. Yet below or above is something that calls for actions either to raise the bar of excellence or cultivate to restore the form. Measuring and publishing standards are not the same thing. Standards are necessary to measure performance and to ensure processes are performed correctly. Also to serve as a base for developing new processes. They should never be viewed as cast in concrete as it is necessary to focus on improving processes. Michel, I have to agree with you, standards must be developed to ensure consistency. The real question is, how do we ensure that operations are always carried out properly? Often the operator optimizes the working stages, is it correct to stop this proactivity or must be standardized? If so, how? I observed some time video clips related to on the job training also very effective and can be displayed and show on the work stations . I agree with some of the above comments. There is little point in embarking on a process analysis program for the first time until a rigorous study of the core processes has been carried out, eliminating waste and optimising the value stream. However, once standard time values have been established for the new processes, each one needs a procedural review. Any improved processes need to be analysed again and the standard times revised. The result is that the standard time value is as up-to-date as possible for management to apply them to set meaningful process targets, resource planning, line balancing, delivery predictions, and performance monitoring as part of the organisation’s operational and strategic overview. Standards are the only way to lock in process improvements/kaizen bursts.